The Australian television series, The Weekly, recently ran an exposé on the putative benefits of the profusion of whey protein powders currently being marketed as bodybuilding aids. Their evidence suggested that the use of these products resulted in, at best, ‘very expensive urine’, but they are nonetheless sold promising miraculous weight-loss and muscle-mass increase. These advertisements with their wild spurious claims put me in mind of the nineteenth-century image of the snake-oil salesman, hawking his concoctions of dubious origin and even more dubious efficacy on unsuspecting rubes. A leaf through almost any late nineteenth-century periodical will turn up at least one print ad for some sort of wonder elixir, a significant portion of which are alleged to function upon the nerves. The advantage to this claim was that it was very difficult to disprove, the nervous system being still little understood. 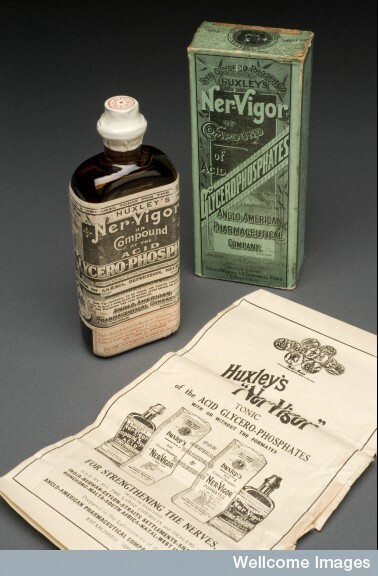 Huxleys Ner-Vigor was sold as a strengthening tonic for the nerves . Like other medical products of the period, it contains a small measure of strychnine. Not surprisingly, this medical fiction became evident in literary fiction also, with a number of writers imaginatively exploring the mental and physical possibilities, and potential dangers, of successfully achieving superior, or even superhuman, nervous functioning. Frank Aubrey’s The Devil Tree of El Dorado: A Romance of British Guiana (1897), for example, featured a herbal potion designed to restore energy to the nerves and lengthen the individual life-span by an extraordinary degree. Edith Nesbit’s ‘The Third Drug’ (1909) imagined a remedy whose imbiber may, if his nervous system could successfully withstand the potent effects induced by the first and second drugs, develop superhuman powers of sensory perception, memory, and understanding. More famously, Robert Louis Stevenson’s Dr Jekyll devises a formula that releases his animalistic and uncivilised self in the shape of the demonic Mr Hyde. Frequently, these potions are figured as drastically, and often quite violently, reconfiguring and rewiring the nervous system in order to wreak some kind of evolutionary advantage by bringing its processes up to speed with the mental and physical demands of modern life. The topic held a particular fascination for H.G. Wells, as in his Invisible Man (1897), where the medical student Griffin invents chemicals capable of rendering the human body invisible. Wells was intimately familiar with the late nineteenth-century fashion for nerve tonics, having served an apprenticeship in a chemist in his younger days, which experience inspired the satirical treatment of the patent medicine industry in Tono-Bungay (1909). However, it is his 1901 short story ‘The New Accelerator’ that most neatly demonstrates the period’s preoccupation with nerve tonics and their place in a changing culture. The tale concerns one Professor Gibberne, an unrivalled chemist of soporifics, sedatives, and anaesthetics, who has dedicated himself to developing an ‘all-round nervous stimulant to bring languid people up to the stresses of these pushful days’. As Gibberne observes, the human experience of ordinary time is steadily accelerating, and the constant whirl of external stimuli is increasingly operating at a level beyond the capacity of the human mind and nervous system to process effectively. His eponymous new accelerator is therefore designed to redress this balance, for, unlike what he sees as the rather more unequal and localised operations of other nerve tonics, it is designed to stimulate all the individual’s physiological and cognitive processes by several hundred orders of magnitude at once. This will effectively speed up the operations and reaction times of both mind and body, and push them beyond the present physical and spatio-temporal limitations of the age. On consuming the Accelerator together in an act of self-experimentation, Gibberne discovers that, because of the speed with which his nervous system is responding to external stimuli, the outside world has apparently slowed almost to immobility. A bee appears to hang in the air with its wings ‘flapping slowly and at the speed of an exceptionally languid snail’; a little poodle dog is ‘suspended in the act of leaping’, and the music of the marching band playing nearby is reduced to ‘a low-pitched, wheezy rattle, a sort of prolonged last sigh that passed at times into a sound like the slow, muffled ticking of dummies hung unstably in mid-stride, promenading upon the grass’. To the outside observer, meanwhile, Gibberne is moving at such a speed that he blurs into invisibility from the naked eye, and is thereby freed from the demands and responsibilities of modern life. Wells’s picture of the nervous system’s workings was based on speculation (as indeed were the nerve tonics actually sold), but he was in fact more accurate than he may have suspected. In 2014, the BBC reported upon the case of a man who suffered an aneurysm that effectively slowed down his perception of time (http://www.bbc.com/future/story/20140624-the-man-who-saw-time-freeze). Waking with a headache, he took a shower, only to find he could see the water droplets coming from the shower head hanging in mid-air. The case was not unique, and it is not uncommon for the brain to initiate this kind of time warp at moments of extreme stress. It is actually possible, researchers at Valtteri Astila University in Finland maintain, to train the brain to perform in this way on cue, as some professional surfers and ballerinas are able to do. Sadly, no one has yet found a way to bottle and sell it in Boots.